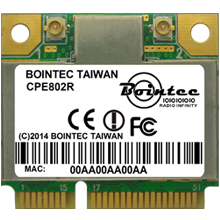 CPE802R product Accord with FCC CE and is 300Mbps wireless miniPCIe adapter which has lower power consumption, high linearity output power, accords with IEEE802.11bgn, and supports IEEE802.11i safety protocol, along with IEEE 802.11e standard service quality. 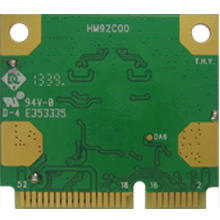 It connects with other wireless device which accorded with these sstandards together, supports the new data encryption on 64/128 bit WEP and safety mechanism o WPA-PSK/WPA2-PSK, WPA/WPA2. Its wireless transmitting rate rises 150M, equivalent to 10 times of common 11b product. It's easy and convenient to link to wireless network for the users using desktop, laptop and other device that needs connect to wireless network. Indoors up to 100m, Outdoors up to 300m.